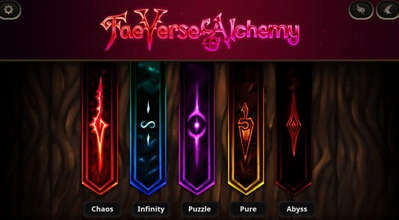 This is the Full Premium version of FaeVerse Alchemy (apk). Follow the alchemical path of magic in this new puzzle game where you combine different elements to form greater ones in an effort to create the most powerful elements of all. - An engaging and challenging puzzle game where you combine three or more of one kind of element to form a single piece of a higher quality element. - Chaos Mode - Anything can happen! Inventory begins randomize, all items can drop. It's true chaos! - Pure Mode - Item drops are not possible, pure alchemy gameplay. Play this mode first! - Puzzle Mode - Solve puzzles! We will be new adding puzzle packs involving the many special items over time! - Infinity Mode - Overflows never cause game over. - Abyss Mode - Daily Challenge Mode! Play once per day. Everyone in the world has the same game possible. Will you get the high score? IMPORTANT - HOW TO PLAY : The basic rules are simple. Combine like elements together to form higher quality elements. In Chaos Mode, there are many items that can cause special interactions. To view what items may do press the ? button at the top right. We recommend playing Pure mode for your first time playing. On screen buttons, and touch screen style controls are supported.